I was staying in a pub up in Lancashire, the purpose of my trip was a funeral, but as ever on such occasions it was good to get together with family for a meal and some fond reminiscences. With a big table of diners all choosing different dinner options there was no point in trying to pick a wine that could go well with fish and chips, Sicilian pasta, baked cod with minted potatoes and the marvellously weird Lancashire Rag Pudding, a sort of meat pasty that looked like it had been wrung through a mangle. We opted for a Rioja instead, as a wine that everyone liked, and some water that people could drink with their meal, and enjoy the wine afterwards if the clash was too great. Koden doesn’t sound like a terribly Spanish word, or a Lancastrian one at that. It turns out it’s an Aztec one, an untranslatable word that implies the point in a woman’s life when she is at her most fabulous. I like to think that’s right now, and will continue to be right now until it’s my funeral. 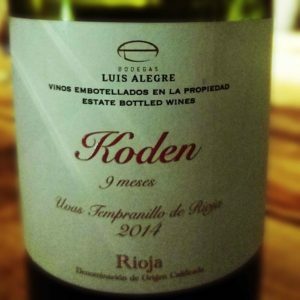 Luis Alegre Koden Rioja Alavesa ’14 was a bright cheerful red, more Lego than claret red. It smelled of fresh crushed fruit, strawberry and cherry, with a little vanilla. It’s all Tempranillo, all the time. It tasted of fresh fruit too, with red and blackcurrants joining the cherries and strawberries. The vanilla got a bit of help too with some light aniseed which made the wine taste a little more grown up than it smelled. The alcohol was certainly at the adult level. 14% gave it some weight and added a warming mouthfeel along with the smooth, ripe tannins. Whilst this was £25 in the pub, expect to pay a little under half that at Oddbins if you’re buying it for home consumption. Hello, great review, have tried that wine previously from Oddbins and enjoyed it. Is it possible to subscribe to your posts? I was expecting to find a subscribe box somewhere…I’m probably being blind! Try the RSS feed in the top right corner, that should keep you up to date. Thanks for stopping by.